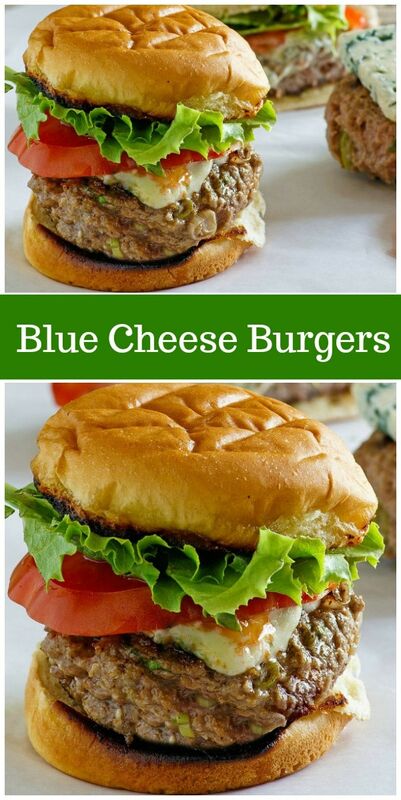 Here’s a quick and easy recipe for Blue Cheese Burgers. 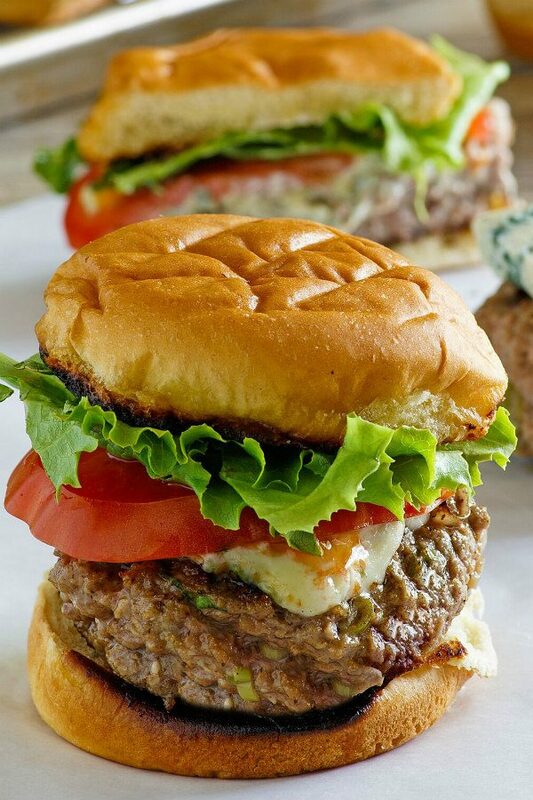 These are grilled beef burgers stuffed with a generous slice of blue cheese. There’s nothing better than a tall, well-built burger with a ton of flavor. This is one of those burgers! 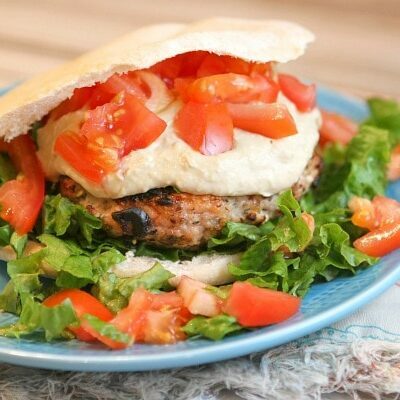 This blue cheese burger is so easy to prepare. It’s lean ground beef blended with green onions, salt, pepper and fresh sage. The recipe makes four burgers. The burgers are shaped into 8 patties so you can use two and seal a thick piece of blue cheese in between each burger. They’re grilled to perfection. 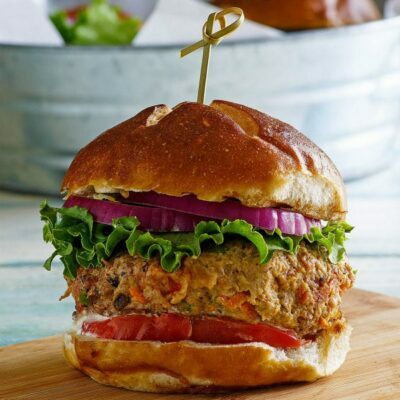 It’s a great, gourmet-type burger to serve at one of your summer barbecues. Everyone likes to try something a little bit better than your average, boring burger. 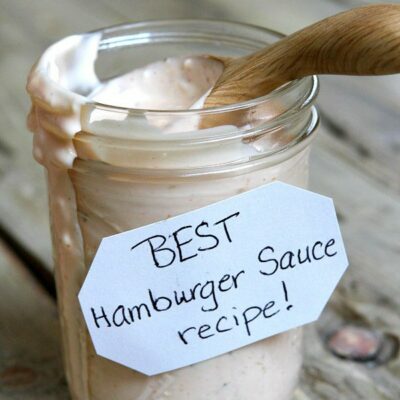 Pile lettuce, tomato, onion, and whatever condiments you enjoy on your burger. You’re going to love these! 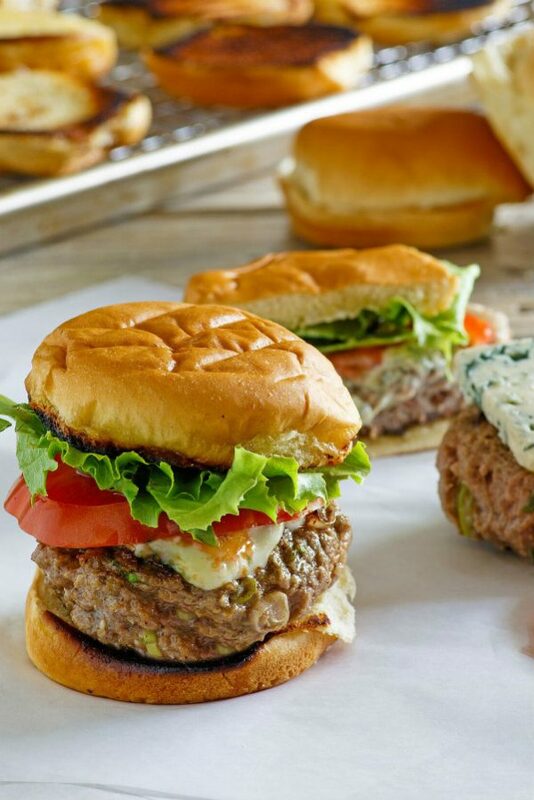 With Father’s Day, 4th of July and Memorial Day weekends looming ahead this summer, I think these burgers deserve to make at least one appearance at your barbecues. If you’re into blue cheese, you might also enjoy my Blue Cheese Cole Slaw or this Green Beans Blue Cheese Salad. Bacon Blue Cheese Deviled Eggs are lookin’ good too. And of course I love my Blue Cheese Ball for parties! 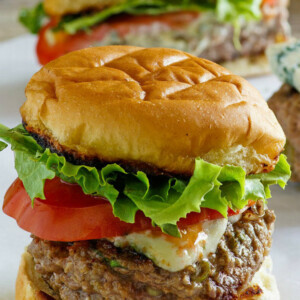 Beef burgers stuffed with blue cheese! Place ground beef into a large bowl; add green onions, salt, pepper and sage and mix well together. Divide meat mixture into 4 equal portions, and then divide each portion into 2, giving 8 portions of meat. Flatten each into a burger shape. Place a slice of cheese on top of 4 of the burgers and top with the remaining 4, sealing with a little bit of water. Heat grill and cook burgers about 4 minutes per side, or until done. Serve on toasted rolls topped with another half slice of cheese, lettuce and tomato. *Nutritional information does not include buns and condiments. Coincidentally, I just made a hamburger patties filled with blue cheese yesterday. I hadn’t seen this post. 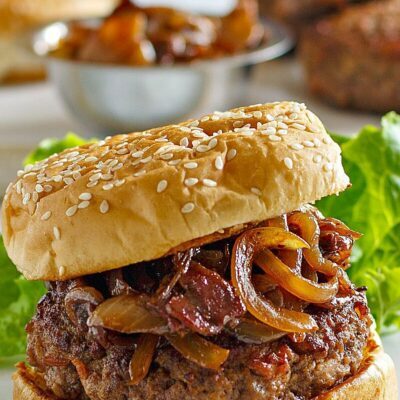 I didn’t season the hamburger with sage or green onion but certainly will try that next time I make them. My husband said they were about the best thing he’s ever eaten. Maybe he was just in the mood for something like that. Hopefully so, because I’ve made MANY different recipes over the years. Anyway, a great combination. These are the BEST burgers!